To read an article's abstract click on the title. Access to full articles may require login to the UC Davis libraries. Carey, R. L. (2019). American Journal of Education, 125(3), 000-000. Black and Latino adolescent boys and young men from low-income communities face numerous perceived and actual barriers to achieving their post-secondary educational goals. To advocate for more precise interventions, this study investigated how black and Latino eleventh grade boys’ college ambitions were shaped by their school’s college-going culture, racial stereotyping, and their families’ economic marginalization. Drawing from social cognitive theory, the author examined the boys’ college-going dilemmas as internal (e.g., participants’ self-assessments of their academic [un]preparedness and [un]ease about making new friends) and external (e.g., concerns about affording college, given limited financial resources and familial responsibilities). Underrepresented and in/visible: A Hispanic first-generation student’s narratives of college. Pyne, K. B., & Means, D. R. (2013). Journal of Diversity in Higher Education, 6(3), 186-198. Despite improvements in the rates of college admission over the past few decades, college persistence, retention, and graduation rates continue to be problematic for underrepresented students—students of color and students from low-income and/or first-generation families. This article presents a case study of a female, first-generation, low-income Hispanic student during her 1st year at a highly selective, private, predominantly White university. Drawing on critical race theory and qualitative research methodologies, it explores and understands key incidents prior to matriculation and throughout 2 semesters, focusing on those connected to racial, ethnic, and socioeconomic identities, as well as social and academic interactions and relationships. It recenters discussion on the lived experiences and insider’s perspectives of a historically marginalized student, stories often omitted from the research or hidden within the broader statistics on success and failure. Using the metaphor of invisibility/visibility to capture ongoing tensions, it highlights her strategies for success while deconstructing the subtle social and institutional discourses that work against her and create hidden stress, struggle, and doubt. It paints a complex portrait of what “success” may look like for such students in our current higher educational spaces. The false choice between race and class and other affirmative myths. Pruitt, L. R. (2015). Buffalo Law Review, Vol. 63, 981. American universities increasingly admit first-generation college students whose parents do not have 4-year degrees. Once admitted, these students tend to struggle academically, compared with continuing-generation students-students who have at least 1 parent with a 4-year degree. We propose a cultural mismatch theory that identifies 1 important source of this social class achievement gap. Four studies test the hypothesis that first-generation students underperform because interdependent norms from their mostly working-class backgrounds constitute a mismatch with middle-class independent norms prevalent in universities. First, assessing university cultural norms, surveys of university administrators revealed that American universities focus primarily on norms of independence. Second, identifying the hypothesized cultural mismatch, a longitudinal survey revealed that universities' focus on independence does not match first-generation students' relatively interdependent motives for attending college and that this cultural mismatch is associated with lower grades. Finally, 2 experiments at both private and public universities created a match or mismatch for first-generation students and examined the performance consequences. Together these studies revealed that representing the university culture in terms of independence (i.e., paving one's own paths) rendered academic tasks difficult and, thereby, undermined first-generation students' performance. Conversely, representing the university culture in terms of interdependence (i.e., being part of a community) reduced this sense of difficulty and eliminated the performance gap without adverse consequences for continuing-generation students. These studies address the urgent need to recognize cultural obstacles that contribute to the social class achievement gap and to develop interventions to address them. Stephens, Nicole M.; Fryberg, Stephanie A.; Markus, Hazel Rose; Johnson, Camille S.; Covarrubias, Rebecca. (2012). Journal of Personality and Social Psychology, 102(6), 1178-1197. Avoiding the manufacture of ‘sameness’: First-in-family students, cultural capital and the higher education environment. O'Shea, Sarah. (2016). Higher Education, 72(1), 59-78. Drawing upon Bourdieu’s theories of social and cultural capital, a number of studies of the higher education environment have indicated that students who are first-in-family to come to university may lack the necessary capitals to enact success. To address this issue, university transition strategies often have the primary objective of ‘filling students up’ with legitimate forms of cultural capital required by the institution. However, this article argues that such an approach is fundamentally flawed, as students can be either framed as deficit or replete in capitals depending on how their particular background and capabilities are perceived. Drawing on interviews conducted with first-in-family students, this article explores how one cohort considered their movement into university and how they enacted success within this environment. Utilising Yosso’s Community Cultural Wealth framework, this article discusses how these individuals drew upon existing and established capital reserves in this transition to higher education. A cultural mismatch: Independent cultural norms produce greater increases in cortisol and more negative emotions among first-generation college students. Nicole M. Stephens, Sarah S.M. Townsend, Hazel Rose Markus, L. Taylor Phillips. (2012). Journal of Experimental Social Psychology, 48(1), 1389-1393. American universities increasingly admit first-generation students—students whose parents do not have four-year degrees. Once admitted, these students experience greater challenges adjusting to universities compared to continuing-generation students—students who have at least one parent with a four-year degree. This additional adversity is typically explained in terms of first-generation students' relative lack of economic (e.g., money) or academic (e.g., preparation) resources. We propose that this adversity also stems from a cultural mismatch between the mostly middle-class, independent norms institutionalized in American universities and the relatively interdependent norms that first-generation students are socialized with in working-class contexts before college. As predicted, an experiment revealed that framing the university culture in terms of independent norms (cultural mismatch) led first-generation students to show greater increases in cortisol and less positive/more negative emotions than continuing-generation students while giving a speech. However, reframing the university culture to include interdependent norms (cultural match) eliminated this gap. Affirming independence: Exploring mechanisms underlying a values affirmation intervention for first-generation students. Tibbetts, Yoi; Harackiewicz, Judith M.; Canning, Elizabeth A.; Boston, Jilana S.; Priniski, Stacy J.; Hyde, Janet S. (2016). Journal of Personality and Social Psychology, 110(5), 635-659. First-generation college students (students for whom neither parent has a 4-year college degree) earn lower grades and worry more about whether they belong in college, compared with continuing-generation students (who have at least 1 parent with a 4-year college degree). We conducted a longitudinal follow-up of participants from a study in which a values-affirmation intervention improved performance in a biology course for first-generation college students, and found that the treatment effect on grades persisted 3 years later. First-generation students in the treatment condition obtained a GPA that was, on average, .18 points higher than first-generation students in the control condition, 3 years after values affirmation was implemented (Study 1A). We explored mechanisms by testing whether the values-affirmation effects were predicated on first-generation students reflecting on interdependent values (thus affirming their values that are consistent with working-class culture) or independent values (thus affirming their values that are consistent with the culture of higher education). We found that when first-generation students wrote about their independence, they obtained higher grades (both in the semester in which values affirmation was implemented and in subsequent semesters) and felt less concerned about their background. In a separate laboratory experiment (Study 2) we manipulated the extent to which participants wrote about independence and found that encouraging first-generation students to write more about their independence improved their performance on a math test. These studies highlight the potential of having FG students focus on their own independence. Closing the social-class achievement gap: A difference-education intervention improves first-generation students’ academic performance and all students’ college transition. Nicole M. Stephens, MarYam G. Hamedani, Mesmin Destin. (2014). Psychological Science, 25(4) 943-953. College students who do not have parents with 4-year degrees (first-generation students) earn lower grades and encounter more obstacles to success than do students who have at least one parent with a 4-year degree (continuing-generation students). In the study reported here, we tested a novel intervention designed to reduce this social-class achievement gap with a randomized controlled trial (N = 168). Using senior college students’ real-life stories, we conducted a difference-education intervention with incoming students about how their diverse backgrounds can shape what they experience in college. Compared with a standard intervention that provided similar stories of college adjustment without highlighting students’ different backgrounds, the difference-education intervention eliminated the social-class achievement gap by increasing first-generation students’ tendency to seek out college resources (e.g., meeting with professors) and, in turn, improving their end-of-year grade point averages. The difference-education intervention also improved the college transition for all students on numerous psychosocial outcomes (e.g., mental health and engagement). Living–learning programs and first-generation college students’ academic and social transition to college. Karen Kurotsuchi Inkelas, Zaneeta E. Daver, Kristen E. Vogt, and Jeannie Brown Leonard. (2006). Research in Higher Education, 48(4), 403-434. This study examines the role of living–learning (L/L) programs in facilitating first-generation students’ perceived academic and social transition to college. Using a sample of 1,335 first-generation students from 33 4-year institutions who participated in the National Study of Living–Learning Programs during Spring 2004, the results of the study show that first-generation students in L/L programs reported a more successful academic and social transition to college than their first-generation counterparts living in a traditional residence hall setting. In addition, interactions with faculty members and using residence hall resources facilitated an easier academic transition for first-generation students in L/L programs, and supportive residence hall climates were related to an easier social transition. A preliminary interpretation of this study’s results is that structured activities, such as faculty interaction and residence hall programming, are more influential for this population than informal peer groups. Whose culture has capital? A critical race theory discussion of community cultural wealth. Yosso, T. J. (2005). Race ethnicity and education, 8(1), 69-91. This article conceptualizes community cultural wealth as a critical race theory (CRT) challenge to traditional interpretations of cultural capital. CRT shifts the research lens away from a deficit view of Communities of Color as places full of cultural poverty disadvantages, and instead focuses on and learns from the array of cultural knowledge, skills, abilities and contacts possessed by socially marginalized groups that often go unrecognized and unacknowledged. Various forms of capital nurtured through cultural wealth include aspirational, navigational, social, linguistic, familial and resistant capital. These forms of capital draw on the knowledges Students of Color bring with them from their homes and communities into the classroom. This CRT approach to education involves a commitment to develop schools that acknowledge the multiple strengths of Communities of Color in order to serve a larger purpose of struggle toward social and racial justice. Critical race theory, Latino critical theory, and critical raced-gendered epistemologies: Recognizing students of color as holders and creators of knowledge. Bernal, D. D. (2002). Qualitative inquiry, 8(1), 105-126. For too long, the histories, experiences, cultures, and languages of students of color have been devalued, misinterpreted, or omitted within formal educational settings. In this article, the author uses critical race theory (CRT) and Latina/Latino critical theory (LatCrit) to demonstrate how critical raced-gendered epistemologies recognize students of color as holders and creators of knowledge. In doing so, she discusses how CRT and LatCrit provide an appropriate lens for qualitative research in the field of education. She then compares and contrasts the experiences of Chicana/Chicano students through a Eurocentric and a critical raced-gendered epistemological perspective and demonstrates that each perspective holds vastly different views of what counts as knowledge, specifically regarding language, culture, and commitment to communities. She then offers implications of critical raced-gendered epistemologies for both research and practice and concludes by discussing some of the critiques of the use of these epistemologies in educational research. “Is that paper really due today?”: Differences in first-generation and traditional college students’ understandings of faculty expectations. Collier, P. J., & Morgan, D. L. (2008). Higher Education, 55(4), 425-446. Success in college is not simply a matter of students demonstrating academic ability. In addition, students must master the “college student” role in order to understand instructors’ expectations and apply their academic skills effectively to those expectations. This article uses data from focus groups to examine the fit between university faculty members’ expectations and students’ understanding of those expectations. Parallel discussions among groups of faculty and groups of students highlight important differences regarding issues of time management and specific aspects of coursework. We find definite incongruities between faculty and student perspectives and identify differences between traditional and first-generation college students. We argue that variations in cultural capital, based on parents’ educational experiences, correspond to important differences in each group’s mastery of the student role and, thus, their ability to respond to faculty expectations. The conclusion discusses the theoretical and practical implications of considering role mastery a form of cultural capital. Student–faculty interaction in research universities: Differences by student gender, race, social class, and first-generation status. Kim, Y. K., & Sax, L. J. (2009). Research in Higher Education, 50(5), 437-459. This study examined whether the effects of student–faculty interaction on a range of student outcomes—i.e., college GPA, degree aspiration, integration, critical thinking and communication, cultural appreciation and social awareness, and satisfaction with college experience—vary by student gender, race, social class, and first-generation status. The study utilized data on 58,281 students who participated in the 2006 University of California Undergraduate Experience Survey (UCUES). The findings reveal differences in the frequency of student–faculty interaction across student gender, race, social class and first-generation status, and differences in the effects of student–faculty interaction (i.e., conditional effects) that depended on each of these factors except first-generation status. The findings provide implications for educational practice on how to maximize the educational efficacy of student–faculty interaction by minimizing the gender, race, social class, and first-generation differences associated with it. First-generation students' academic engagement and retention. Soria, K. M., & Stebleton, M. J. (2012). Teaching in Higher Education, 17(6), 673-685. This study investigates differences in academic engagement and retention between first-generation and non-first-generation undergraduate students. Utilizing the Student Experience in the Research University survey of 1864 first-year students at a large, public research university located in the United States, this study finds that first-generation students have lower academic engagement (as measured by the frequency with which students interacted with faculty, contributed to class discussions, brought up ideas from different courses during class discussions, and asked insightful questions in class) and lower retention as compared to non-first-generation students. Recommendations that higher education faculty can follow to promote the academic engagement and retention of first-generation students are addressed. The role of motivation, parental support, and peer support in the academic success of ethnic minority first-generation college students. Credits Dennis, J. M., Phinney, J. S., & Chuateco, L. I. (2005). Journal of college student development, 46(3), 223-236. The role of personal motivational characteristics and environmental social supports in college outcomes was examined in a longitudinal study of 100 ethnic minority first-generation college students. Personal/career-related motivation to attend college in the fall was a positive predictor and lack of peer support was a negative predictor of college adjustment the following spring. Lack of peer support also predicted lower spring GPA. Breaking down barriers: Academic obstacles of first-generation students at research universities. Stebleton, M., & Soria, K. (2013). The purpose of this study was to examine the perceived academic obstacles of first-generation students in comparison to non-first-generation students. Using the Student Experience in the Research University (SERU) completed by approximately 58,000 students from six research universities, the researchers used nonparametric bootstrapping to analyze differences between first-generation and non-first-generation students' obstacles to academic success. The results suggest that first-generation students more frequently encounter obstacles that compromise their academic success as compared to non-first-generation students, such as job responsibilities, family responsibilities, perceived weak English and math skills, inadequate study skills, and feelings of depression. Implications for learning assistance professionals are outlined. Blue-collar scholars? : Mediators and moderators of university attrition in first-generation college students. Martinez, J. A., Sher, K. J., Krull, J. L., & Wood, P. K. (2009). Journal of college student development, 50(1), 87. Many college entrants’ parents do not have college degrees. These entrants are at high risk for attrition, suggesting it is critical to understand mechanisms of attrition relative to parental education. Moderators and mediators of the effect of parental education on attrition were investigated in 3,290 students over 4 years. Low parental education was a risk for attrition; importantly, college GPAs both moderated and mediated this effect, and ACT scores, scholarships, loans, and full-time work mediated this effect. Drug use, psychological distress, and few reported academic challenges predicted attrition, independent of parental education. These findings might inform interventions to decrease attrition. Undergraduate time use and academic outcomes: Results from the University of California Undergraduate Experience Survey 2006. Brint, S., & Cantwell, A. M. (2010). Teachers College Record, 112(9), 2441-2470. Background/Context: Previous research has established the significance of academic study time on undergraduate students’ academic performance. The effects of other uses of time are, however, in dispute. Some researchers have argued that students involved in activities that require initiative and effort also perform better in class, while students who engage in mainly passive entertainments perform less well. Other researchers have argued that students who are connected to the campus through residence, work, or extracurricular activities perform better, while those who are separated perform less well. Purpose/Objective/Research Question/Focus of Study: The purpose of this study is to develop a theory-based framework for examining the academic consequences of student time and to test hypotheses drawn from this framework using survey data. Research Design: The framework focuses on three dimensions of student time use: study/non-study, active/passive, and connecting/separating. The survey analysis is based on more than 6000 responses to the 2006 University of California Undergraduate Experience Survey (UCUES). Findings/Results: Controlling for students’ socio-demographic backgrounds, previous academic achievements, and social psychological stressors, we find that study time is strongly connected to both academic conscientiousness and higher grade point averages. We find that “activating” uses of time, such as physical exercise and volunteering, are associated with higher levels of academic conscientiousness, but not directly to higher grade point averages. Time spent on “passive” entertainments show negative associations on academic conscientiousness. Uses of time that connect students to campus life showed relatively weak and inconsistent effects, as did uses of time that separate students from campus life. Off-campus work was an exception. It showed a strong net association with lower grade point averages. Conclusions/Recommendations: Our findings have implications for theory: They lead to a stronger focus on academic study time as the central key to positive academic outcomes, and a renewed focus on off-campus work as a major obstacle to positive academic outcomes. They suggest further that college and university administrators should find ways to “unplug” male students from their computer entertainments and to help minority students who need to work to find employment on campus. The effects of social and cultural capital on student persistence: Are community colleges more meritocratic? Wells, R. (2008). Community College Review, 36(1), 25-46. This study examines the influences of social and cultural capital on persistence from 1st to 2nd year and how these effects differ between community colleges and 4-year institutions. Results show that social and cultural capital have a positive association with student persistence overall but matter less when students begin at a community college. Is grit relevant to well-being and strengths? Evidence across the globe for separating perseverance of effort and consistency of interests. Disabato, D., Goodman, F., & Kashdan, T. (2018). Journal of Personality. Objective: Researchers conceptualize grit as the combination of two facets: perseverance of effort and consistency of interests toward long‐term goals. We tested the reliability of grit facet scores across the globe and examined how differently each grit facet related to well‐being and personality strengths. Method: An international sample of 7,617 participants from 6 of the 7 continents (excluding Antarctica) completed an online survey. Results: Confirmatory factor analyses and omega reliability coefficients indicated that the 12 items from the original Grit Scale were multidimensional and reliably measured perseverance of effort and consistency of interests. Concurrent validity analyses showed that perseverance of effort was moderately to strongly related to subjective well‐being, beliefs about well‐being, and personality strengths, whereas consistency of interests had weak or negative correlations with these outcomes. The stronger relations with perseverance of effort were replicated across 7 regions of the world. The presence of overall grit was supported in individualistic countries, but not collectivistic countries (Latin America, Asia). Conclusions: We discuss the multidimensionality of grit, including a conceptual understanding of overall grit and how it may differ across cultures. We suggest well‐being and strengths researchers study grit facets separately due to their differential validity. 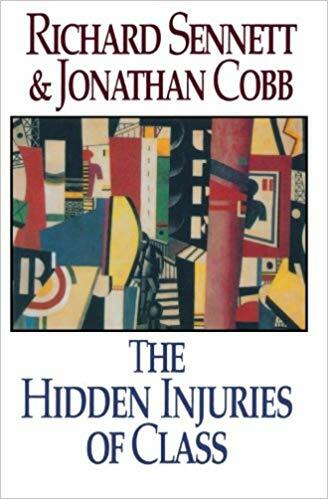 Sennett, R., & Cobb, J. (1993). The Hidden Injuries of Class. WW Norton & Company. A report by the Pell Institute.